Online Orders: We will call you to confirm any service order to confirm all of the details but at checkout you can leave a comment at to let us know the date that your boat will be ready to wrap, the boat name or registration the first full day that your boat will be available for shrink wrapping and we will have it done within 7-10 days or sooner depending on the weather and scheduling. We always call a couple days before coming out just to check in and let you know that we'll be on the boat but there is no need to be there, we are pros and will take care of your boat with carefulness and efficiency. Please let us know if you have a painted hull so we can prepare accordingly to wrap it the right way. Feel free to call us with any questions you may have at 800-847-5290 and talk with an experienced shrink wrap pro today. 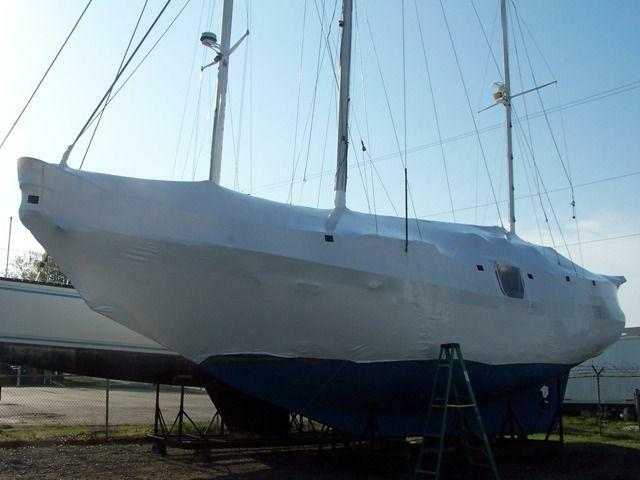 Our standard services include wrapping down to the waterline to ensure even coverage on the hull of the boat, thorough ventilation with various styles of shrink wrap vents used in several locations on the boat with special attention paid to peak areas where water vapor and condensation are most likely to collect. For boat owners who would like to have access to the inside of the cover during the coverage period, zipper doors are an option with an additional charge. Call today or check out online by selecting your boat size and type below, indicate your preference of a zipper door size (if any) and use the boat location for the "Shipping Address". At the present time we are servicing the boating areas of North Eastern Maryland, Delaware and Southeastern PA, boats with location addresses that are outside of our service areas will be unable to checkout. From wearing booties on your boat to taping every last heat sealed seam, we take pride in being one of the original shrink wrapping companies in the U.S with a 25+ year history and it shows in the final product on your boat. Taking care of the details includes being careful with your flexible windshields, keeping pressure off of radar and antenna equiipment, creating a structure that will shed rain, withstand wind and wrapping right down to the waterline, everytime. Either way is fine with us, mast down is quite a bit easier so plan on a ten percent discount if yours is stepped but with our experience on the Chesapeake and Delaware Bays for over 25 years, we've got our process down pretty good if we do say so ourselves. Add a re-usable zipper door and let us know if you have a painted hull so we can prepare accordingly to wrap it the right way.